To write or read a poem is often to think in distinctively poetic ways—guided by metaphors, sound, rhythms, associative movement, and more. Poetry’s stance toward language creates a particular intelligence of thought and feeling, a compressed articulation that expands inner experience, imagining with words what cannot always be imagined without them. Through translation, poetry has diversified poetic traditions, and some of poetry’s ways of thinking begin in the ancient world and remain potent even now. 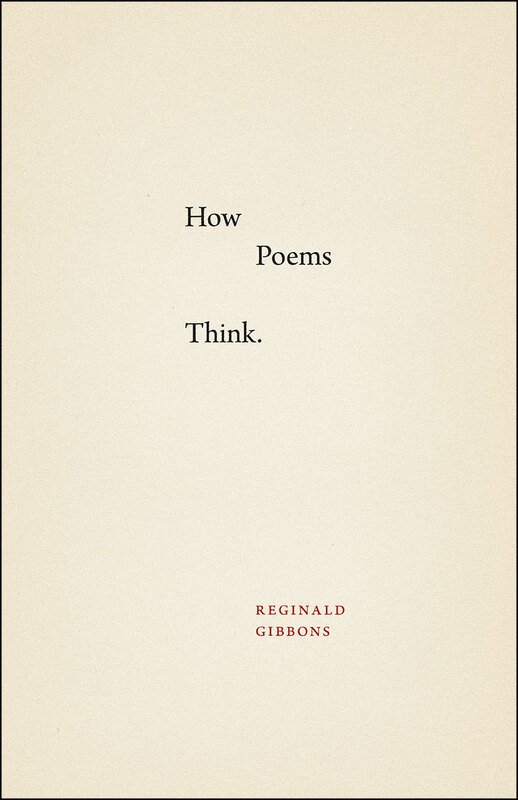 In How Poems Think, Reginald Gibbons presents a rich gallery of poetic inventiveness and continuity drawn from a wide range of poets—Sappho, Pindar, Shakespeare, Keats, William Carlos Williams, Marina Tsvetaeva, Gwendolyn Brooks, and many others. Gibbons explores poetic temperament, rhyme, metonymy, etymology, and other elements of poetry as modes of thinking and feeling. In celebration and homage, Gibbons attunes us to the possibilities of poetic thinking. "This is a writers’ book—a must for poets. Poet-critics get at the meaning behind literary forms, and Reginald Gibbons does just that. He analyzes leaps of thought urged by rhymes, metaphors, and lexical choices. Chapters on the translation of Russian and of ancient Greek poetry are dazzling. This enormously readable book is part memoir, part report, part essay—and always conjectural, reaching forward." "From ancient times to the present, poetry has created gods, and gods in turn have sustained poetry. Ranging from Homer, Pindar, and Sappho through French Symbolism and modern Russian to American poetry of our day, Gibbons has composed a hymn of praise to the spell-casting powers of patterned language. This erudite study mingles mysticism, philology, psychoanalysis, and mischief: it should provoke the liveliest arguments around."